As the legislature contemplates next year’s budget and the two state welfare agencies prepare to merge to create the largest department in Michigan, the state must remember that a majority of recipients are children in need ‒ Pat Sorenson, senior policy analyst at the Michigan League for Public Policy. Toni Scott of Grand Rapids woke up one morning in 2005 and her arm felt numb and sore, as if she'd slept on it wrong. It turned out she had multiple sclerosis. The debilitating disease attacked her nervous system and shut down her ability to run the cleaning service she started that brought in about $1,200 a month. It also pushed her to a place she’d been able to avoid – the welfare office. Sick and disabled, Scott had to pack up her pride behind a pained smile and go to the state Department of Human Services in Kent County to ask for help getting back what the disease stole from her – money for food and bills. She learned quickly that the DHS office can be a tense place, a tinderbox of emotional people often none too happy that they have to ask for help and state workers sometimes overwhelmed by the volume of those asks. Recently, the morale in the welfare office in Grand Rapids sunk even lower, Scott said. In February, the state cut 100 workers from the Michigan Department of Human Services – 35 worked at a Kent County online processing center in Grand Rapids that was closed. A second processing center, in Detroit, also closed. That left one remaining center, in Lansing, to handle 350,000 applications for food stamps and cash assistance each year. The $7.5 million in staffing cuts to DHS came as the state upped overall spending between 2013 and 2014 by 9 percent from $47 billion to about $51 billion. The state is also planning to merge DHS with the Department of Community Health in April. The move will create the biggest department in the state, raising questions about whether more job cuts may occur. 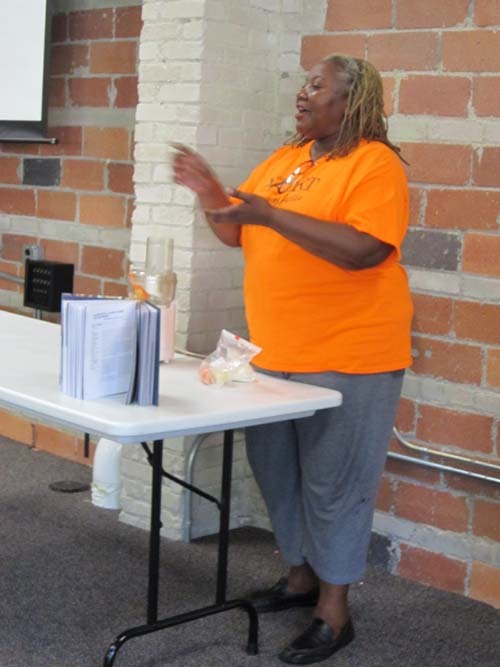 Toni Scott (supplied photo), 55, who receives DHS benefits in Grand Rapids, fears workforce cuts will slow help to needy Michigan families, increase crime. The DHS cuts and merger come at a time when workers say they are already burdened with high caseloads, are finding it challenging to meet deadlines for processing application requests, and as poverty indicators suggest that DHS services remain in high demand. State officials acknowledge that the claims applications handled by the now-closed processing centers will now have to be processed by caseworkers. “Why cut the people who help those who need the most help?” said Scott, 55, of Grand Rapids. The Department of Community Health will merge with DHS on April 10, creating the Michigan Department of Health and Human Services. The new department will have about 14,000 employees. Nick Lyon, director of the Department of Community Health and interim director of the Department of Human Services director, said in a recent column for Bridge that merging the departments will lead to efficiencies, making it possible for clients to get more services from one central agency. It is unclear if that means additional layoffs. Next year’s proposed budget recommends eliminating eight positions in the Supplemental Security Income division that handles payments to disabled residents. DHS hopes to avoid layoffs by moving those workers into other positions, Wheaton said. Statewide, about 3,300 caseworkers handle food stamps and cash assistance cases for vulnerable people and families, helping residents update required documentation, get benefit payments and navigate the system. With the recent cuts, these field workers inherit the job of helping to process the 350,000 online applications a year. Caseworkers may have more tasks, Wheaton acknowledged, but their ranks purposely were not cut. Since getting sick, Toni Scott has found that public assistance helps to support her family, but is no boon. Scott’s daughter is now a 23-year-old adult, so Scott gets food stamps only for herself these days. In February, that came to $53. To survive, she goes to food trucks that offer free fresh produce and makes sure she is at a local church on the third Saturday of the month to get free groceries. She then makes her own sauces, gravies and stews and freezes them for later. Scott picks up an occasional $80 by showing others how to survive, too, by doing cooking demonstrations for Our Kitchen Table, a group that teaches disenfranchised populations gardening, healthy eating and environmental protection in greater Grand Rapids. When local caseworkers told her about the DHS cuts, she wondered if the state’s decision makers understand the possible ill effects on clients. Data is not yet available on whether the February DHS budget cuts have slowed service to needy families. But even before the cuts, union officials say, some DHS field office were not meeting requirements for timely responses to requests for public assistance. For example, DHS is supposed to respond to applications within 30 to 45 days (within seven days in cases of emergency). In Wayne County in January and February, DHS workers were able to meet those deadlines about 89 percent of the time, which is below the 95 percent threshold set by the U.S. government, according to UAW Local 6000, which represents DHS caseworkers across the state. The state made the decision to cut DHS staffing by $7.5 million in June 2014. That was the same year DHS saw a drop in the number of temporary cash and food stamps cases. From 2013 to 2014, cash assistance cases fell from roughly 130,000 families to 90,000, and food stamps cases fell from 1,775,646 to 1,680,721, DHS data show. The dip in Michigan welfare cases is attributed to the state’s economic growth as well as some families being cut off from cash assistance because they hit the maximum 48-month limit, state data show. But a drop in cases does not necessarily mean a drop in need for DHS workers, said Pat Sorenson, senior policy analyst for the Michigan League for Public Policy, a nonprofit based in Lansing that advocates for economic equity. More than two million of Michigan’s nine million residents were enrolled last year in the Supplemental Nutrition Assistance Program, or SNAP, commonly known as the food stamp program. And 1.7 million residents received Medicaid, the most ever, according to state Department of Community Health. More than half of Michigan Medicaid clients are children. Across the state, about 24 percent of Michigan children live in poverty – and 7 percent lived in families with no employed adult in 2013, the same as in the year prior, according to the most recent information from the Kids Count Data Center, which studies the well-being of children nationwide. Ray Holman, spokesman for the UAW Local 6000, said giving caseworkers more administrative duties takes time away from helping needy children and families. Holman’s local held a protest in February at a DHS office on Detroit’s west side. Caseworkers there on average handle as many as 900 cases each, according to the union. Mellisa Cardwell, 33, of Detroit, recently spent more than a hour and half at a DHS office applying for assistance. She said DHS needs more workers in the field. It is not a happy place. On a recent afternoon, a handful of people slumped in blue chairs waiting to be called by a security guard to approach a customer service desk that is encased in ceiling-high glass. Across the dingy white-and-blue-checkered linoleum floor, a row of computers line the back of the room. That’s where Mellisa Cardwell, 33, spent more than an hour and a half filling out an online application for services. Cardwell works in customer service at a healthcare call center, but still gets food stamps and publicly-funded health care to make ends meet for herself and her two children. “I called on Monday and still no call back and it’s Friday. So I had to come down here. I totally dread coming here,” she said. Hate to sound cynical, but if the Republicans are pushing it, you can be sure the least among us will suffer. It would be interesting to know what Mr. Lyon's private thoughts are about the reorganization and job cuts. In his position, as a spokesperson for the new and larger department, it's hear no evil, see no evil, speak no evil. There appears to be no compelling rationale for the merger and the job cuts other than to make it more difficult and thus to discourage poor people from applying for (and reapplying for) benefits. The performance measurement system in place appears to reward DHS caseworkers for finding ways of getting people off the rolls. No doubt many are discouraged by the heavy workloads. Others are finding out that they are not rewarded for doing what they had hoped to do as professional social workers--helping people in ways that can better their lives. John you seem to truly understand what has been going on. Frank, please know that not all DHS workers are out there trying to screw people over. Many are in the profession to help people. The reality is, though, they are carrying out the policies of an ADMINISTRATION that views their clients as enemies. This includes trying to do more work with fewer people and not being provided the support necessary to actually help folks. This is one of the reasons morale at DHS is at an all time low. Most workers DO want to help people, but are stuck without any real options to do so thanks to state cuts and policies designed exclusively to save the state money, rather than help those in need. that is the most ridiculous bunch of nonsense I have ever heard. As a caseworker I can tell you, we are treated like the enemy with management and like dirt by the clients. No one is lying to keep people from getting their benefits. With case loads over 800 what do you expect? Clients need to be proactive and handle their business--they have ONE case, we have HUNDREDS, we can't hold your hand. They have made us data processors, NOT social workers. My caseworker lied and claimed I didn't report that I was moving to Alabama when I have witnesses that will testify that I did. They're now trying to make me pay them over $1600. For failing to report that I moved. I know of someone else this exact same thing happened to and he had a different caseworker than me. Frank - I will address what the other two people that replied to you did not. Your tax payment example was absurd. The limits to programs are set every year in the fall, the effective date is the state's fiscal year, Oct. 1. You give the impression the payment limits are set case by case. NOT so. As to "lazy" caseworkers, are you really naive enough to think in a workforce of 14,000 people at ANY company, there wouldn't be a few deceiftful ones? Client have many options, they can call Lansing, they can ask for a supervisor, they can file a written complain, they can file a hearing. As to the receptionist with the tooth problem, I don't honestly know. If true, that is very sad. But she had other options as well - contact the local dental school, or another humanitarian agency etc. Can you cite your source for the folllowing comment: "Agency workers lie, file false reports, delay timely filings of clients and accuse them of filing questioners late in order to remove them from the roles" I have worked in DHS and have never seen anything like this, nor have I seen supervisors encourage workers to do anything like this. My initial thought is that you just made this up, however I will offer you the opportunity to provide PROOF of this slanderous statement. I think you need to dig deeper. The funding cuts are just the beginning of the issue. About a year ago, the DHS offices started heavily discouraging paper applications for assistance, forcing the clients to do the applications online, into an online system that is heavily flawed. Many first time users do not know what information and documentation they need if they apply, and many are not computer literate. Additionally, the state removed the online screening tool that would inform users if they are likely eligible for services. “We support trying to find efficiencies. We’re taxpayers and want tax dollars to go as far as possible. We’ve been saying for years we have too many managers,” Holman said. “We need to put the resources with the people who actually deal with the public.” TOO MANY CHIEFS NOT ENOUGH INDIANS"
This is very discouraging and will not lead to a more "efficient" department. As someone who has direct experience with DHS (I was a foster parent and now a father of a son), in my experience these workers are overburdened and, therefore, the time and services available to spend with each case is minimal, at best, and ineffective at worst. I feel for these workers and the people who depend upon them. I tend to lean more fiscally conservative in my perspectives, but I cannot see the value in short-changing this system in hopes that it will be more "efficient". I am all for getting people off of welfare and getting them training and into jobs in which they can support themselves and their families, but I doubt that cutting funding and workers from this process will help. Tim - I often think "constant change" is part of the strategy. Keep people guessing etc. Obviously Federal policy changes and court decisions cannot be avoided and are causative for much of the change, but not all by any means. The GOP continues its ongoing assault on those who need the most help. The idea of merging departments to improve efficiency may look good on paper, but it ALWAYS results in layoffs and less service. Taking a fragmented system and integrating services is not an attack on those in need. Creating a system that permits ready access to information and assistance is not an attack on recipients. And doing away with certain discrete functions/positions and integrating them into the system does not necessarily result in loss of jobs. If done properly, these are all useful approaches to controlling the cost of welfare without harming anyone. Finally, the disenfranchised are those who are deprived of the right to vote. Misuse of the word in this article. The key here is "if done properly". The GOP has used improving efficiency time and again to cut services. When mental health closed many of the state facilities under Engler in the 90's they cut the money rather than sending it to the local mental health agencies to offer the services needed by those discharged from the closed facilities. Later they merged the Dept of Mental Health with Public Health, in the name of efficiency, this resulted in further cuts in mental health services. Now they want to merge things further to cut service even more. The GOP always phrases it in terms of integrating services and improving efficiency but the bottom line has always been a reduction in services. I call that an ongoing assault on those who need it most. "The dip in Michigan welfare cases is attributed to the state’s economic growth as well as some families being cut off from cash assistance because they hit the maximum 48-month limit, state data show." It would have been extremely helpful if the two categories had been broken out separately. All those who are so concerned about the welfare of poor people should consider whether or not economic growth is not, in the long run, a more effective way of helping people in difficult circumstances. The motives of welfare advocates can be broken down into a genuine desire to help people in need, and a simple desire to just redistribute resources to poor people. Someone who exemplifies the latter motive is Pat Sorenson. "But a drop in cases does not necessarily mean a drop in need for DHS workers, said Pat Sorenson, senior policy analyst for the Michigan League for Public Policy, a nonprofit based in Lansing that advocates for economic equity." Would Ms. Sorenson also say that an increase in cases does not necessarily mean an increase in the need for DHS workers? Whenever I see a journalist or a politician make a claim of "welfare" cuts, I prefer to go to the facts rather than accept their claim. So I went to the State of Michigan website where the full, comprehensive, certified state financial reports are in full view. The two departments of "Health Services" and "Human Services" constitute just over 40% of the entire state expenditures -- more than Education and Public Safety & Corrections combined. Here is the recent spending of State of Michigan Human Services & Health Services combined: 2014: $20.5 billion; 2013: $19.8B; 2012: $19.7B; 2011: $20.3B; 2010: $19.3B; 2009: $17.7B; 2008: $16.1B; 2007: $15.2B. The further back you go, the lower the spending. Here is the point: for all of you commenters with a political agenda: clearly, FAR more billions have been spent on Health & Human Services in Michigan under Snyder's tenure than under Granholm's tenure. In the last 5 years, nearly $100 BILLION has been spent on health & welfare in this state. Is that mind-boggling? Is there anyone that believes it is OK to just continue this without looking for ways to do it better? Sadly, it appears that this article and its response indicates that some people are OK with the status quo. The vast majority of the budgets you are talking about are federal dollars that simply flow through the state agencies. SNAP, for example, is 100% federally funded. Because of the great recession, we had a record number of people signing up for SNAP. The same goes for medicaid, housed in DCH. So while these budgets might look like they've grown under Snyder, the reality is that the growth is attributable to federal flow-through dollars, not an increase in state investment in these departments. A more accurate measure would be to examine the amount of state general fund dollars going to these agencies. It's all about the children!.....No not really, it's all about the bottom line. CPS has had a lot of problems, and a great portion of the problem is the overloading workers with paperwork and huge caseloads. This cutting of services to the poorest is a long-standing pattern. Years ago, the closing of mental health services in Detroit, noted above, sent people out to Novi for help. This resulted in a drop in the number of people requesting services. A miracle! Governor Engler cut mental illness incredibly by this action! The truth, of course, was that poor persons without cars had no way to travel out to Novi and back through the bus system, without taking an entire day or more. Later Engler combined the inspection services for Nursing homes and Child Care Centers, and urged many senior inspectors to retire rather than being fired. No matter that the skills and knowledge for inspecting those very different settings aren't the same. Closing the offices that process requests for assistance may save the state money in the short run, but it will not help Michigan's citizens. And many of our most vulnerable citizens will suffer as a result. More will do badly in school, and more will end in worse condition, with lives that are far below their original potential. I despair seeing the attitudes that approve such things. Who are we, if we do not care for our citizens? What kind of state and country are we becoming? I worked for Kent Co. DHS for over 17 years and retired in 2009 because I just couldn't handle the caseload size anymore. With mandated time frames cases had to be opened and correctly, sometimes over 100+ phone calls a day, and client's calling the governor's or their local representative's office to complain about the long wait for benefits I just had to go. I loved my job. It paid well, had great benefits, and I loved helping my client's most of all. Do any of you know what it's like having a mom call you and beg over and over to have her food stamp case opened before Christmas? Older sick people with medical conditions that there just wasn't time to gather all the endless paperwork together to forward to the state's medical team to make a decision about much needed benefits. Now that they are cutting more workers they will continue to force seasoned workers to retire and replace them with newbies who will take over a year to bring up to speed. Politicians have no clue what happens on a day to day basis and how many times have I heard that workers will be forced to do more with less? Citizens lose in the long run. For every SNAP benefit cut, every applicant denied, every eligible beneficiary cut off, the local economy suffers. People buy food at local stores. Local stores pay municipal and state taxes. Local stores create jobs to meet demands of shoppers. Less shoppers means less jobs. Now, these stores are in a position to "donate" food that has expired its shelf life as a tax write off to local food pantries. Giving old food to the people. What better way to prepare a young child for the future as poor nutrition will produce a child who will eventually have medical and psychological needs, of course through Medicaid. This is why the Departments are merging. Medicaid Expansion is expected to fill the policy and budget holes of the social safety net, but will, in turn only inure some so call charity. I am waiting to see how the State is going to handle Medicaid Fraud. I am going to just sit back and watch the mess unfold, while eating my popcorn. The poverty rate and the per capita rate of Blacks on Social programs is ridiculous and unsustainable. When will the discussion turn to the lack of family structure in the Black Family. As is typical, I did not read anything about the Father in the article of the two women. I have no sympathy for Melissa Cardwell having to wait an hour and a half for taxpayer assistance. She chose to have those children without a firm financial backing. I am tired of supporting this way of life. As former VP Dan Qayle warned us when the Murphy Brown TV show came out glamorizing single motherhood. He cautioned that vast numbers of children living like this is unsustainable. Poverty breeds poverty. Very few break out. Mark, US Senator Moynihan, in 1965, wrote about the the family and how it impacts the children. "The role of the family in shaping character and ability is so pervasive as to be easily overlooked. The family is the basic social unit of American life; it is the basic socializing unit. By and large, adult conduct in society is learned as a child." - See more at: http://www.blackpast.org/primary/moynihan-report-1965#chapter2 This seems to be an issue under appreciated in the discussion of Michigan schools along with the lack of interest in student learning when talking about education. I am a caseworker, and have been employed by the state of Michigan for 10+ years. Read your statistics there are more Caucasians on public assistance. A family friend was a caseworker in Michigan and found it so depressing and discouraging that she ended up quitting, this was back in the 1970s, not much has changed it would appear. The merger is to create a "one stop shopping" for clients per Snyder. Providing friendly, accurate and helpful services to the public seems to be what is most important. However, all I see are budget cuts, layoffs and new, innovative ways to apply for benefits that have created an absurd amount of problems; adding to the already existing problems. With that said, caseworkers are literally pee'ons so to speak. They are over worked with caseloads that are far beyond unmanageable; taking away their ability to give help to those in need in a timely manner! Policy is CONSTANTLY changing AND not in ways that would benefit that worker or the client. There are so many computer system issues that never end causing delays in processing. An average application used to take anywhere from 20 minutes to an hour. Anymore it's taking an hour or longer. In my experience as a caseworker, I have found that most caseworkers actually do care about helping the client. They put themselves in the position of the client but after doing the job for years they get wore down by the way they are treated by the clients, the broken system and the overwhelming amount of work; never feeling accomplished or as if they are literally drowning with no hope in sight. The amount of phone calls alone is enough to drive anyone mad. It's amazing to me how people can call, hang up and call back 30, 40, 100 times in a row AND never leave a message! They yell at you, verbally assault and not following through with their part of returning exactly what is needed. Putting myself in their shoes, I can understand their frustration; Needing help, unable to get answers or in contact with their worker and receiving correspondence that sometimes has verbiage you would need a lawyer to help you understand! When a worker has a caseload of 650, it makes it so far beyond difficult to answer every phone call, explain all correspondence, fix problems in cases, process applications and... take a lunch break. The powers that be decide how all of the system will work and what policy will be...all of this is without ever having done the job themselves to really understand or see it from a realistic view! Everything looks great on paper. They need to stop fixing things that aren't broken and actually work on fixing what is. Don't get me wrong though. I agree that there are some horrible caseworkers out there. Moral is low. The system is flawed. Some programs have policy that requires accountability by the client but there are also programs that literally give benefits away with no proof required. Income limits push clients to need the system...BUT what is a government without a society that depends on it? Marie, as a retired casewoker I want to thank you for laying out our problems in such a sustinct way. I especially want to state that the computer system is terrible. There have been so many problems with it that have caused hours of delays. I wonder what the purpose is for all of these programs and agencies, is it to help people change their plight or is it to deliver benefits/money? If it is the latter then I expect the State agencies can be the most efficient at achieving that purpose. If it is to help people change their plight then I would turn to the non-government agencies in the State, as one example the Catholic Charities. I wonder why there isn't any mention of contracting out the social welfare activities to those who seem currently very active in helping people, who have a public oversight of their activities, and who are conscientious about the results they achieve. I very much agree with those lamentin the unsustainable position the government (we the taxpayers) has gotten itself into. The common thread seems to be not enough resources are being directed to those in need. Both adults and their children. How about putting the responsibility back to those creating and continuing the problems. Children born out of wedlock or at least out of a responsible family financial structure are not the governments responsibility. When a husband and wife with one child decides to add another, the family income is now shared among four, not three. Not the way it works on welfare. The pie simply gets bigger. That cannot continue. Allocate support on a per family basis. The more children one has, the less per child. There has to be a solution developed to put an end to this entitlement madness, entitlement to money, to speedy service, to anything you have not worked for. All policy makers políticians would be made to live on welfare benefits starting with going through the whole process. Applying and waiting. They should be made to have no Access to monetarias and live in low income housing with their families. They should have this experience in order to pass policy. I have degrees and personal experience. I know it from the bottom up. I would be excellent at solving this problem of revamping dhs. This is an election years lets do something for real change. Many families that are in need have been recently cut by hundreds not just a few dollars. These are families that have disabilities. Their answers are not solutions but to turismo away our suffering.